I have downloaded the android app on my minix. On my laptop it work with the windows player but it won’t play on the minix. So you have your android device connected and registered in your CMS, but when you schedule something to it, it doesn’t want to show it? Could you please show us a screenshot of status window on your android device? my 14 day trial period has ended. Can I get a longer trial period? If the trial period has expired then the Player won’t be able to connect to the CMS to get updates. 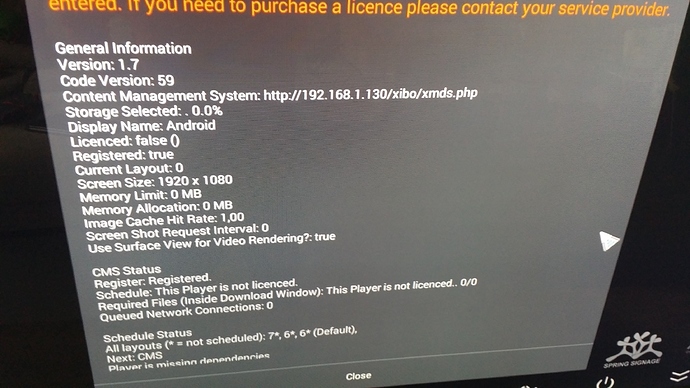 You will need to purchase a licence to continue using the Player app. During the trial period I was able to connect to the cms but the content wouldn’t play. Only thing I got was a black screen with xibo info.